Birds are undoubtedly the most obvious visitors to our gardens. Often brightly coloured, invariably engaging and sometimes endearing, it is little wonder that so many of us encourage them into our gardens by providing food and nesting opportunities. 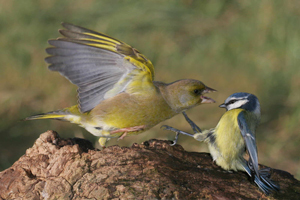 Many of the birds visiting a typical garden will only be using the garden because of the feeding opportunities on offer. 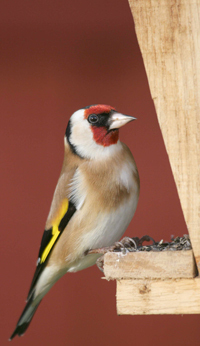 It has been estimated that up to 75% of households provide food for wild birds at some point during the year and, nationally, the bird feeding industry is estimated to be worth some £200 million annually. Other birds nest in our gardens or on our properties, with some birds making use of the many tens of thousands of nest boxes available across the country. There is a great deal that we still have to learn about the value of gardens and their associated resources for wild birds. Garden-based surveys will be important in providing answers to these questions. An interest in garden birds is a great starting point for those developing their interest in birdwatching. You can pull up an armchair and learn to recognise the different species visiting your garden feeders with little more than a pair of binoculars and a bird book. Gardens are also great places in which to discover more about bird behaviour and to learn why birds do what they do.